/ Balance - Core Products / Fitter Classic 16"
By Lucky DUDE from EPHRATA,PA. Introducing the next generation of Balance Boards. 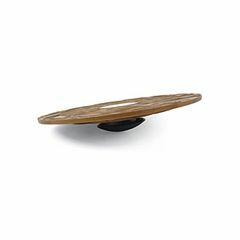 The Fitter Classic 16" Wobble Board's patented dual level fulcrum allows the board to adjust from basic to advanced with a simple twist of the wrist. The more you use your Wobble Board, the better your agility and reaction skills become. This leads to greater confidence in daily activities and improved posture! It's more fun to stand and move on a balance board than to stand on a normal floor. The more you use them the more you'll like them! At work or at home, stand on a Wobble Board while you're talking on the phone and you will quickly feel the huge carry over to your free time activities. It takes no extra time from your day and you will quickly enjoy the benefits of stronger ankles and better balance. It's like improving your golf swing or strengthening your skiing while you work at your desk. Quality of life is often equaled to quality of movement. Regular use of balance boards is a great way to maintain better balance and confidence. For most seniors, either an intermediate 20" Wobble or a Rocker Board is a good choice. Research has proven that regular use of Wobble Boards will dramatically enhance your strength, R.O.M., stability and power in the push off cycle. They will help you reduce the risk of both sudden trauma and over use injuries, thanks to improved proprioception and greater strength in all muscles, tendons and ligaments. Using one daily is like buying insurance against future injuries. Easy To Use. Strengthens. Easy Storage. Comfortable. Quiet Operation. Easy To Setup. Sturdy. great and very helpful with getting the range of movement back in my foot, after surgry. Easy To Setup. Easy Storage. Sturdy. Comfortable. Strengthens. Quiet Operation. Easy To Use. Great product! We use it to strengthen our daughter's hand, body & eye coordination which was recommended by her visual therapy doctor. Compact. Easy To Use. Sturdy. My son is an avid skateboarder and broke the tibia and fibula bones in his leg. He has used the wobble board as part of his physical therapy program, and it has helped him tremendously! Easy Storage. Easy To Setup. Quiet Operation. Not Effective. Hard To Use. I had very high hopes for this product, and I am sorry to say that it's been a disappointment. Maybe it's me, but I have to report that it has not delivered on any of its promises, even though I have faithfully followed the instructions. It seems a bit flimsy, and I only weigh 115 pounds! In addition, it just doesn't seem to do much in terms of helping with toning, strengthening, or even balance. Still, it could be me, so I hope others have much more success. I have heard much better things about the wooden version. Multifunctional. Targets Muscles. Sturdy. Easy To Use. General Fitness. Sports Training. rehab. got it fast. it works great! Is there a weight limitation for the person using it? what is the height of the plastic one? or the degrees? is it adjustable as the wood one is?